Close to 700 orthodox Jews from Hackney attended the event. There were quite a few speeches by both Rabbis and members of the community. The speakers condemned the recent numerous attacks by the Zionist Police on religious civilian Jews, though mostly they explained why true Orthodox Jews do not believe in the Zionist ideology and therefore do not recognise the state of Israel. It was stressed time and again that contrary to Zionist propaganda, the Zionist do not represent the Jewish Nation or its religion. One speaker mentioned that ironically the British police presence was to protect the protesters and help the smooth running of the event, but should the protes1 have been held in Jerusalem the police would be present to scare, attack and even maim the protesters. A Holocaust survivor pointed out that the recent tactics of the Zionist police, reminds him of the actions of the Gestapo in WWII. There was a big video screen displaying pictures of Zionist police attacking civilians. 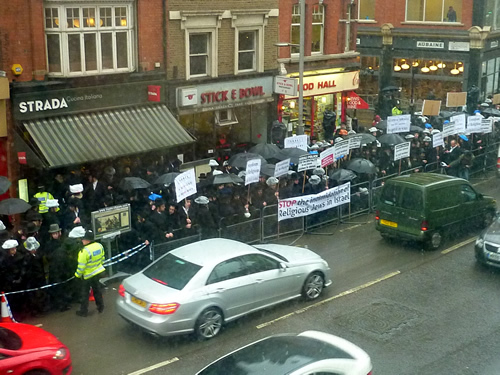 On Monday, 13th February 2012, Orthodox Jews will gather outside the Israeli Embassy in London to express outrage at the Zionist government's treatment towards orthodox Jewish people in Israel. 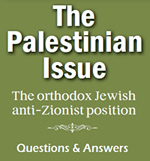 The protesters will bring to the awareness of the public who may not yet all be familiar with, the fact that the Zionist ideology and all that it stands for, including its so called STATE, is contrary to the Jewish religion and the holy Torah. The Zionist state has fundamentally been created to eradicate the authentic Jewish religion. It's because of their blind hatred towards anything and anyone who lives strictly in accordance with the laws of the Torah, that the Police at the behest of Israeli government officials are harassing, and using violence against orthodox Jews all across the Holy Land. The Israeli Police have also been using the illegal and unethical tactic of pressing false and inHated charges against various orthodox Jews and leaders! These hold the threat of stiff prison terms, and are used in order to silence and scare legitimate protesters. Other tactics include late night police raids at homes of individuals, aimed at scaring them, their wives, and their children (reminding us of different eras in Jewish history). G-D has no need for the creation of a Jewish state or the building of a Jewish army to enable him to protect us if He so desires, we are grateful to the British government for letting us enjoy full freedom of religion, and we pray for the wellbeing of their sovereignty.